Knowledge about Devonian tetrapods has increased dramatically since 1990. The oldest potential tetrapod remains are tantalizing: some ill-defined footprints from Australia, and isolated bones and footprints from different parts of the Old Red Sandstone continent. Some Late Devonian taxa, Metaxygnathus from Australia, Elginerpeton from Scotland and Obruchevichthys from the Baltic area, are close to the evolutionary transition from sarcopterygian fishes to basal tetrapods. In addition, unequivocal latest Devonian tetrapods have been reported from Russia (Tulerpeton), Latvia (Ventastega), China (Sinerpeton) and North America (Hynerpeton, Densignathus). Devonian of Greenland. Initially, attention focused on Ichthyostega, which had been described from nearly complete skeletal remains (Jarvik 1996). Since then, new specimens of Acanthostega have added greatly to knowledge of that animal (Coates and Clack, 1990, 1991; Clack, 1994, 1998a, 2002a, 2003a; Coates, 1996; Ahlberg and Clack, 1998). Discovering the relationships of these basal forms has been difficult (see Box 4.1). The latest Devonian tetrapods all measure 0.5-1.2 m long, and they were carnivorous, presumably feeding on fishes. Acanthostega and Ichthyostega retain a fish body outline with a streamlined head, deep vertebrae and a tail fin (Figure 4.5(c, d)). Both forms have poorly developed wrists and ankles. In Ichthyostega the ribs are unusually massive, and they have broad plate-like processes along their posterior margins that overlap considerably and form a near-solid side wall. 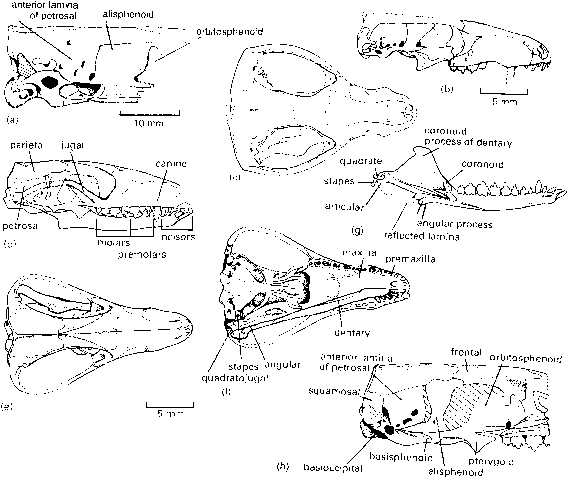 The skull of Ichthyostega looks generally like that of the sarcopterygians Eusthenopteron and Panderichthys in side view (Figures 4.5(a, b, d)), and it retains the buried lateral line canals. Acanthostega, however, has lost certain elements at the back that covered the gill and throat region, and the pectoral girdle is now separate. In dorsal view, it can be seen that Acanthostega (Figures 4.5(c), 4.6(b)) has a broader and shorter skull than Eusthenopteron (Figure 3.24(b)), with the eyes placed further back. Ventrally, the arrangement of bones and teeth is still sarcopterygian.